On August 13, 2012, Gary Gellin set out to break the speed record for a runner on the Tahoe Rim Trail. Gellin wanted to break Killian Jornet’s 2009 record of 38 hours and 32 minutes. Gellin began his run in Tahoe City with 3 other runners. 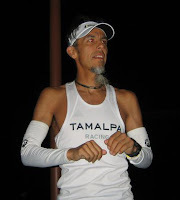 The only runner to finish was Victor Ballesteros with a finishing time of 53 hours and 3 minutes. Adam Hewey dropped at mile 47.6, Ben Lewis dropped at mile 65, and Gary Gellin dropped at mile 79. Gellin had done his homework before the record attempt. He consulted with past record holders and enlisted the help of numerous pacers and volunteers to provide food and water for the runners. Running pacers provided safety and encouragement. In the end, all the planning wasn't enough. The last man running was Ballesteros. Ballesteros and his pacer had made a wrong turn that put them on the popular mountain bike trail called “Mr. Toads Wild Ride”. This mistake cost Ballesteros several hours.